NOW USING GPS AND ACCELEROMETER!! 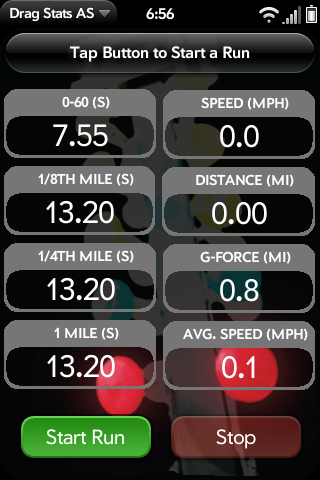 Also added 1 mile timer. Basic 0-60mph timer, 1/8th and 1/4th mile distance timers, speed, average speed and g-force meter. 0.11.0: Added Start countdown and made it look better. Seems to be more reliable than waiting for initial acceleration. Also, gives the opportunity to include the driver's reaction time. Once you start the app you need to keep it still in the same position in your vehicle for the 0-60 time and g-force meter to stay calibrated. There is a small nmber in the upper left corner that shows dynamic accelerometer polling times. I haven't tested this version fully yet but everything seems to be in working order except the stop button is still buggy. ONCE START IS PRESSED YOU MUST EITHER FINISH THE RUN OR RESTART THE APP. I will fix this soon enough. Plan on adding other features and really cleaning it up if this very basic one works well for most people. Simply press the button and once you start to speed up it will start timing and tell you how long it takes you to get to 60mph. I will fix that in the near future. I just wanted to get this version out before working on a fix. I have tried parts of this out on my own and it seems to be pretty accurate but I only have my speedometer to compare it to. If anyone has something to compare it to please let me know how well it compares. Not sure I can get 0-60 times to be any better until Palm lets us increase accelerometer polling. Lite version. Full version has been submitted to Official App Catalog.